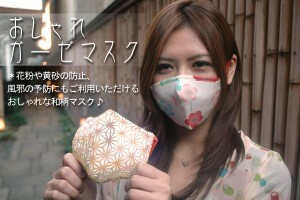 Once again the entire country of Japan has decided to freak-out about the Swine Influenza and all of the Japanese housewives and mothers have frantically busted open their piggybanks and purchased hundreds of thousands of flu masks in a matter of just a few days. 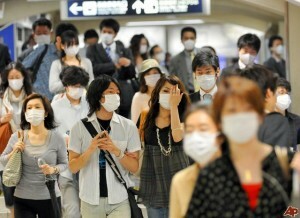 One day everyone will be walking around like normal and then the very next day every Japanese person is walking around wearing a mask. WTF, will someone please tell me how this happens? Is there some kind of telepathy or secret code system that only Japanese people have? Did the government issue some kind of health advisory that only I missed? Actually I think the answer is much simpler and much more banal. Once Japanese people have decided they’re going to freak-out about something, everyone, I mean literally everyone, follows what the rest of the group is doing. In this case it means that if your neighbor starts wearing a mask you had damn well better rush as fast as you can to the drugstore to buy masks for your entire family. However, your daughter has also seen her college friends wearing masks so she too has rushed out to buy masks for the entire family (this is because she was taught well by her mother the importance of doing exactly what everyone else is doing and doing it as quickly as possible). The end result is that you wind up at home with a ridiculous number of flu masks. If you think I’m joking about this I suggest you go on a little recon mission of your local drugstores. I did, and what I found was shocking and disturbing. Of the 4 drugstores in konandai, Japan where I live NOT A SINGLE ONE had any masks for sale. Why, you ask? Is it perhaps because it isn’t flu season yet and therefore the stores haven’t yet stocked up on masks? The answer of course is a resounding NO. The real reason as I stated before is that in the last few days hordes of Japanese housewives and mothers have rushed in and purchased EVERY SINGLE mask in all 4 drugstores. My personal, not founded by medical science because I’m not a doctor opinion is that at this point in the game the whole concept of the flu mask is beyond stupid. The World Health Organization has long since declared the Swine Flu a Global Pandemic and many countries, including I believe Japan, have stated that the number of countrywide Swine Flu cases have reached Epidemic proportions. Translation, so many people have, or have already gotten the Swine Flu that your chances of catching it at some point this season are basically 100%. I for one say screw it, I hope I catch the Swine Flu now so I can get over it while it’s still summer. I mean really, let’s just be thankful that the Swine Flu isn’t any more severe than a normal run-of-the-mill cold. Now, if I can just convince a handful of Japanese people to agree with me and to throw out their masks, maybe, just maybe, the Japanese national “me-too-ism” will kick-in and everyone will stop wearing these silly things. Oh, and if you thought that everyone wearing masks wasn’t bad enough. Check out the designer Versace-esque masks that will soon be hitting drugstores this flu-season. Someone strangle me, please. haha:) Its VERY funy. Im in the other country so I feel very strange but I don’t know if I was in Japan,I would do same thing as the others because I’m Japanese. Japanese people can be so STUPID and CRAZY.lol.